A fabulous 59 piece emergency services themed wooden train set which comes with a play table too! The comprehensive train set contains 8 vehicles altogether including an ambulance, crane, fire engine, digger, train with carriages and a boat. The train set itself features a tunnel, bridge and raised section. There are also numerous people, buildings and trees. This kids play table is made from solid wood. Let your children invite their friends around to play with this unique wooden set play table. The ideal kids toy for the playroom or kids nursery. The wooden train play table encourages group and active play and will be loved by your kids. Flat packed with easy assembly. 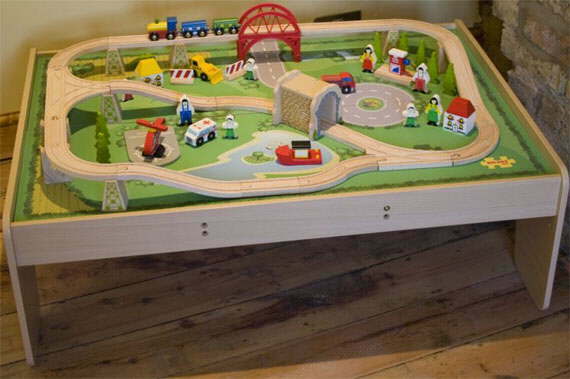 Your kids will love playing with this train set and adding their other favourite toys onto this great wooden table. An ideal nursery toy. Size: 102cm long x 73cm wide x 32 cm high.